Alaska is an interesting place. It’s bright out all night for a couple of months during the summer, but you pay for it with brutally long winters. The riding scene there tends to have a short memory. Most kids grow up and want to leave. When I was there, there were only a handful of people in Anchorage who had been riding for more than a few years. After spending a year up north, it was evident that there was something there worth documenting. With help from a few friends, I set out to make a video that captured the Alaskan approach to BMX. There will always be a few things I wish we had captured, but I think we did a pretty good job of capturing the spirit of things up there. I have to thank Brian Prince, Zac Heinen, Tim and Andrew Fleagle, Darrell Williams and Steve Heilman for contributing footage and helping make this video happen, along with all of the other riders who put in time in front of the lens. Darrell showed up at a video premiere one day and introduced himself. He’d been in the army for a couple of years and I don’t think he’d been on a bike much during that time. The first time he came out to ride he basically had Ratboy’s bike from ten years ago. His seatpost was longer than his bars were wide. It was amazing, but I didn’t expect him to be all that good. Over the next two years, he proceeded to do some of the wildest things I’ve ever seen done on a bike (including the last clip in this video, which is even bigger than it looks). Darrell’s back story is really interesting, and I’m glad we got to capture some of it in the video. He had a lot of old tapes lying around and it was fun seeing a group of guys who managed to have fun in a remote town with almost nothing to ride. I got a tip one day from my wife’s cousin about a spillway that he described as “a big concrete wave”. It took me three trips into the woods to find it, but it ended up being a great spot. It’s way out of town, and we only rode it a few times while I was up there, but there was always evidence around of people skating it so I think it still gets sessioned. We spent a night out there camping and were able to incorporate a 1:00 am hike (it was still August, so it was relatively bright out) and a bear encounter. This lake is on the way to the spot, and there are great skipping rocks on its shores. The Boeke bank was a staple up there. In the summertime the city would put prefab ramps in the outdoor hockey rink beside it, but the bank was always more fun. The city tore a big section out the year I left, only to put some really interesting ledge features in that were a blast to ride. I think this is the only time I’ve witnessed a city making a spot better. Across the parking lot is also the Sullivan rail. Every town seems to have a rail that waits for years for someone to conquer it. The Sullivan rail was a super steep 17 stair kinker that Bryan Gooch was the first to do. I’m not sure if anyone else ever did it. It was replaced with an aluminum rail the year I left. 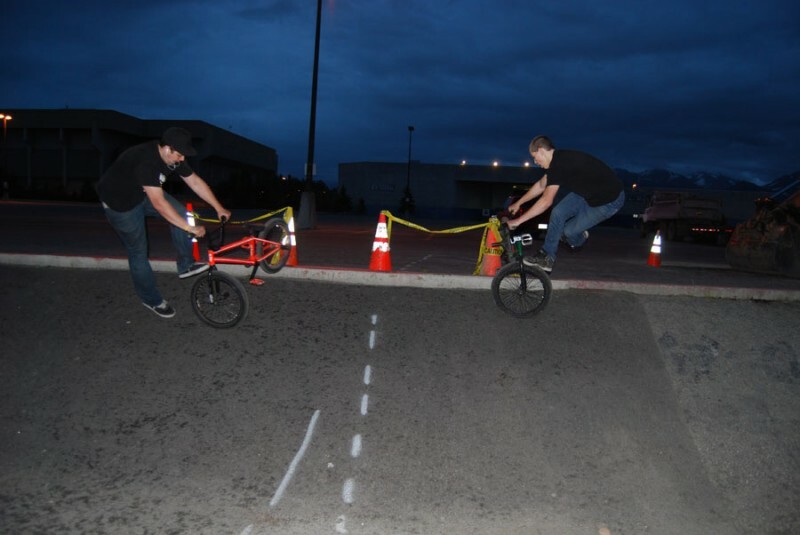 Many late night sessions were had in this parking lot, and this was one of them. The trails in Anchorage had extremely sandy, dry dirt, but it was a fun spot with a lot of potential. At this point, we had mixed cement in with the dirt to make better lips and secured a bunch of carpet to make the landings last more than a day. The runways were chained off most of the time as well. It would take the local mountain bikers a few weeks to cut the locks or dig out the posts we had cemented in when we put something up. We’d show up and all of the lips would be ruined; usually one person would vow to stop building there each time, but the spot always kept going. David Clay was a loose cannon, and he was also increidbly dialed. His superman seatgrabs are amazing. We would make the drive down Turnagain Arm many times during the summer to go to Girdwood skatepark. Girdwood was home to Anchorage’s hippie population, and a mess of ramps from other parks that was once on the cover of Transworld BMX. 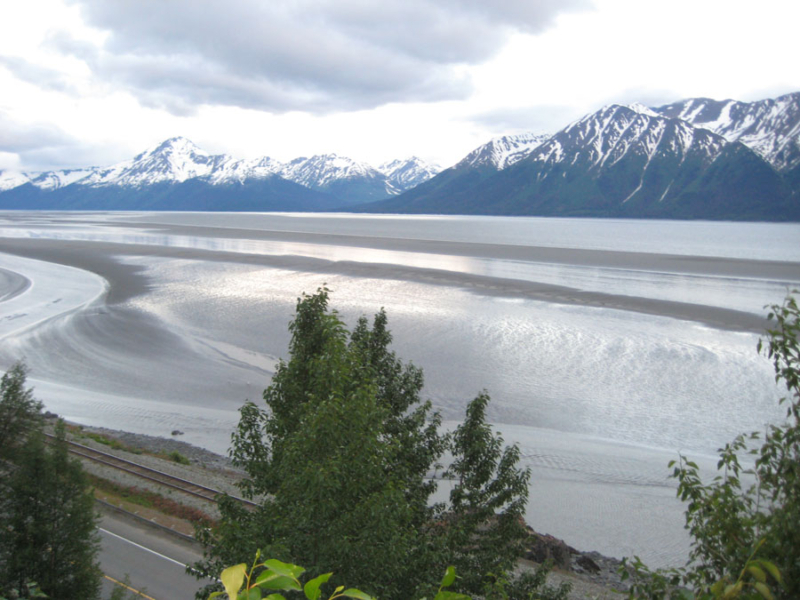 Turnagain arm has some of the most dramatic tides in the world. When the tide goes out, it looks more like a river than and inlet. 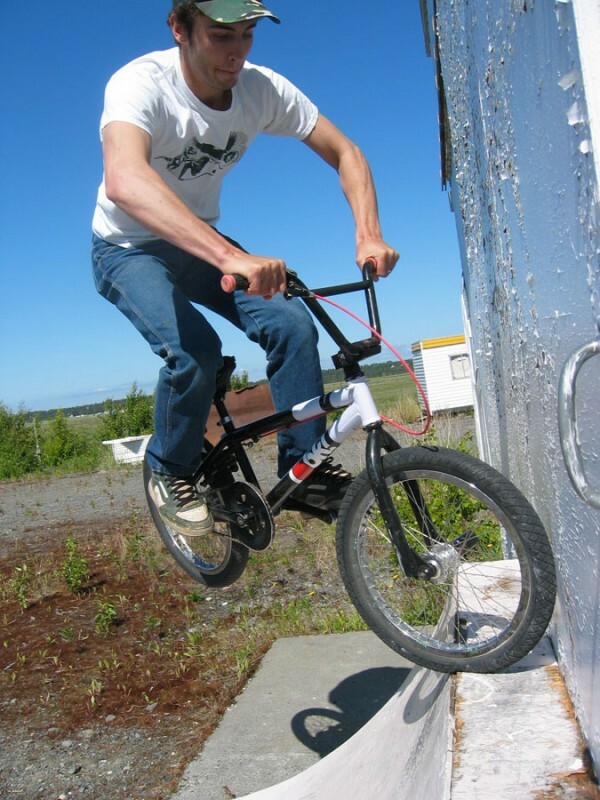 Ryan posted this photo on bmxboard a long time ago and it’s been sitting on my desktop ever since. I might be poaching this, but that guy lives off the grid and has always been impossible to locate. There was a lot of good riding going on in Fairbanks during this period. This photo reminds me of what that scene was like – tons of people riding together and Tim Fleagle killing it. Fairbanks had the closest indoor skatepark; we would make the seven hour drive (or fly) a couple times each winter just to get a session in. The awesome folks at Joel’s place would always let us ride as late as we wanted. David Clay once drove up there with us, rode for a few hours, and then drove straight home through the middle of the night. 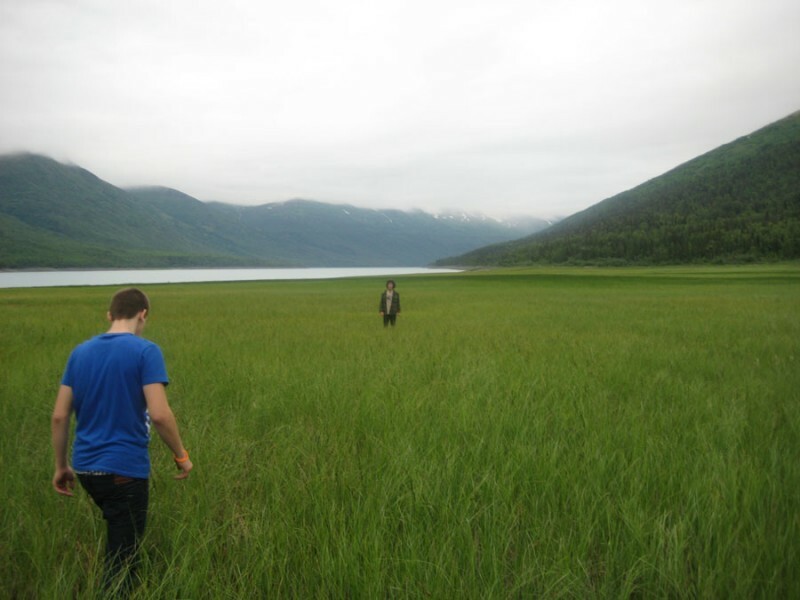 When we first moved up to Alaska, my wife and I lived in the middle of nowhere. There was some scrap wood around the yard, so i built a spine, which would later become a quarter, curved wallride, sub box, bank etc. It eventually ended up at Dragnet, which was an abandoned fish processing building down the river. This was useful for creating more setups, and occasionally finding some shelter from rain or snow. We took a trip to the Kenai peninsula during filming and rode this ramp in the rain. 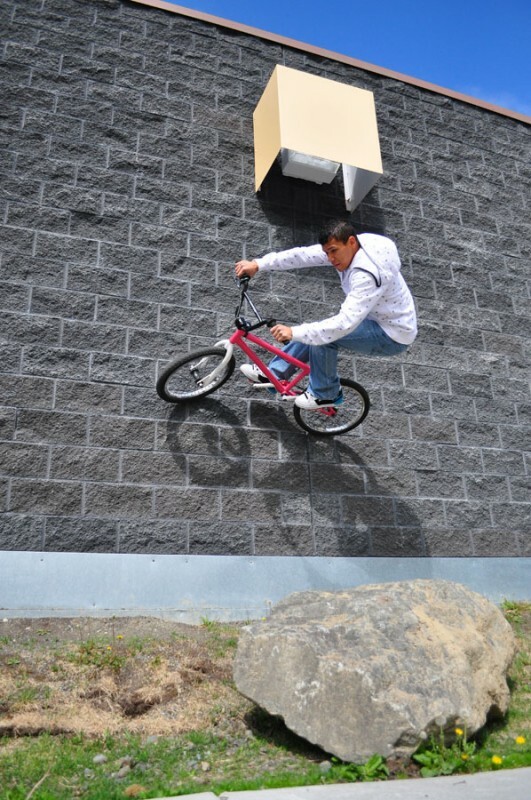 We also rode countless flyouts around Soldotna, witnessed locals riding old Redlines and Dynos way past their potential, and paid an implicit tribute to Vic Murphy, who grew up in the next town over.